January is the month when the Turner’s watercolours which were bequeathed by Henry Vaughan, the distinguished collector, are put on display at the Scottish National Gallery in Edinburgh and the National Gallery of Ireland, Dublin. Henry Vaughan stipulated in his bequest that these delicate watercolours should be ‘exhibited to the public all at one time, free of charge, during the month of January’ and his wishes have been faithfully adhered to for over 100 years. The works are in pristine condition and the limited exposure has meant they retain their luminous colours. The exhibitions in both galleries run for the month of January and are free. ​The four paintings below were in the Windus Collection. The annual exhibition in Ireland of the 31 watercolours in the Vaughan Bequest includes Assos from Finden’s Landscape Illustrations of the most Remarkable Places mentioned in The Holy Scriptures (c.1832-1855). Turner was commissioned to produce twenty-six drawings for this book which sought to satisfy the increasing demand for guidebooks to the antiquities of the Holy Land. 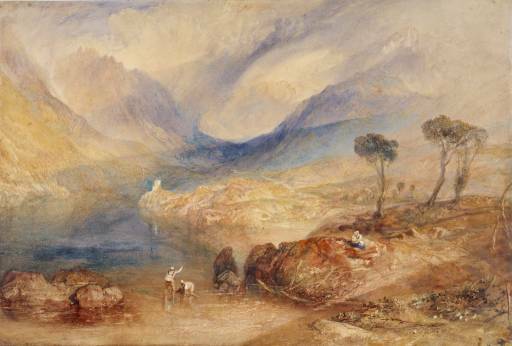 Turner did not visit the region himself but based his watercolour on a drawing by Sir Charles Barry – fourteen of his watercolours for Finden’s Bible are based on his work. Turner’s view of Assos portrays the desolation of a ravaged city. The ruined battlements and classical lintel are the only remaining testimonies to its noble past. The desolation is heightened by the presence of a few tourists who clamber over the ruins and a sense of eeriness is suggested by a large pale sun sinking into the Mediterranean beyond the ancient Gateway. The nimbostratus is gathering, a sign of forthcoming rain. The bequest to the National Gallery of Scotland comprised 38 watercolours. It includes Llanberis Lake and Snowdon – Caernarvon, Wales from Picturesque Views in England and Wales. A painting which conveys the grandeur and beauty of Llanberis Lake and the highest peaks of the Welsh mountains. 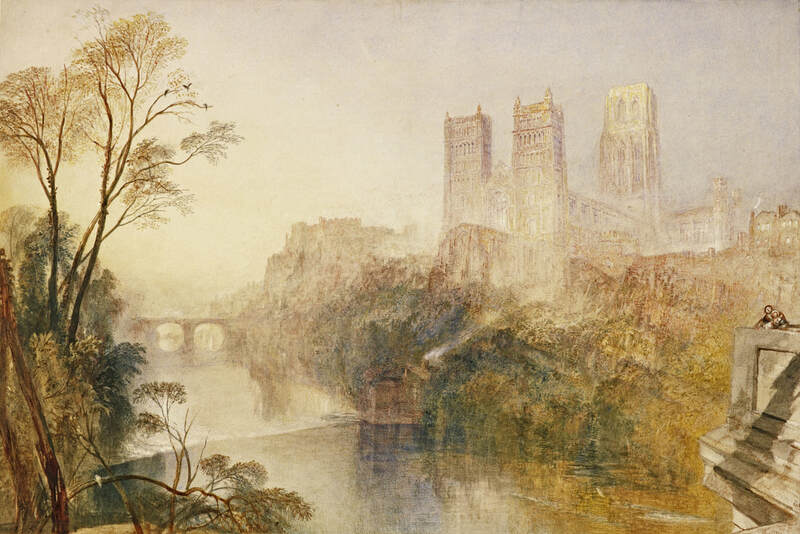 And Durham Cathedral another atmospheric watercolour from Picturesque Views in England and Wales where Turner views Durham castle and the city's cathedral from a bridge over the River Wear. And The Rhymer’s Glen, Abbotsford from Robert Cadell’s edition of Scott’s ‘Works’. Rhymer’s Glen was an area of picturesque woodland much loved by Sir Walter Scott on his Abbotsford estate. Henry Vaughan (1809-1899) was one of the most distinguished and generous of Victorian collectors. He was just twenty-one when he inherited a fortune from his father, who had been a wealthy hat maker. These bequests cover all periods of JMW Turner’s career from his early topographical wash drawings to his expressive images from his later European tours. Henry Vaughan also made bequests to a number of other galleries including the British Museum, Tate and the V&A. Bicknell and Munro, B.G. 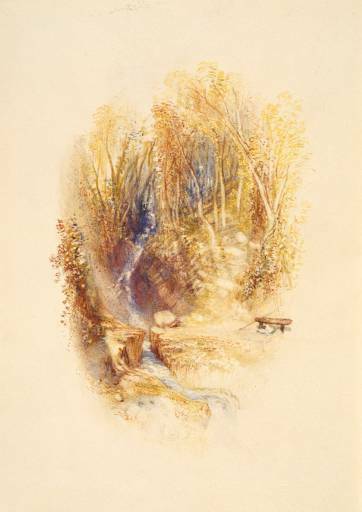 Windus, Henry Vaughan and the young Ruskin were among the small and exclusive group who collected the relatively few watercolours that Turner chose to finish in the last years of his life. 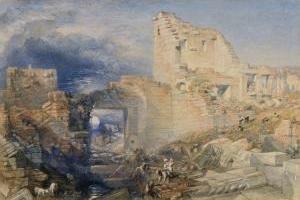 It was partly by studying his work in Windus’s collection at Tottenham Green that Ruskin formed his view of Turner – recognising his unique technical powers but also reasserting earlier readings of the natural and moral truths expressed by his art. ​These collections also fostered the posthumous view, already expressed by the German critic and connoisseur Gustav Waagen in 1854, that these qualities had latterly been seen to ‘far greater advantage’ in Turner’s watercolours than in his oils.